Cisco is the gold standard in networking certifications worldwide. With certifications for all experience levels covering topics in networking, security, collaboration, and more, Cisco's certification programme can meet you where you are on your learning journey and take you to where you want to go. Learning Tree can help you get the training you need to prepare for your Cisco certification exam with Cisco authorised training delivered through our partnership network. 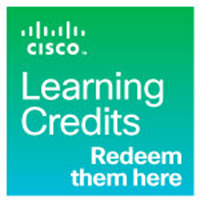 You can redeem Cisco Learning Credits (CLCs) for Cisco training, getting even more value out of the Cisco technologies you use every day.